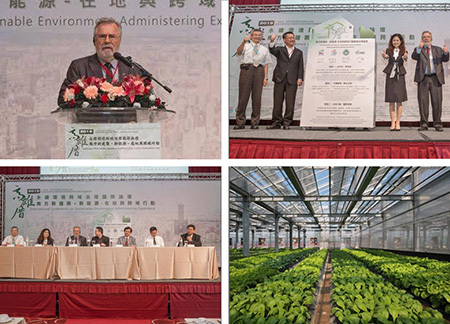 TSSBE sponsored and co-organized workshops, conference and an MOU in Kaoshiung and Pingtung with Kaohsiung City Government and Shu-Te University from Sep. 21 to Sep. 28, 2015. We invited Mr. Nils Larsson to be our keynote speakers and engaged in workshops and conference. The two cities, Kaohsiung and Pingtung, are located in the southern Taiwan. Main organizers and hosts for these events were Dr. Paul Chou, Dr. Daphne Chang and Dr. Annie Kuo. During the visit, a Memorandum of Understanding was signed between iiSBE and Pingtung City Government for future cooperation in environmental policy development, and a meeting was held with Dr. Joseph Yen-yi Li, Secretary of TSSBE. Three long and intensive workshops were held with graduate and senior students focused on SB Tool, exploring details of its structure and how a version for southern Taiwan could be developed. Several site visits were made from local to wetland areas that serve as nature reserves and temporary reservoirs during periods of heavy rain, and a light rail system that is being developed to link the two cities and to reduce the very heavy automotive traffic intensity. Finally, we made a site visit to a local solar farm that has been combined with agriculture in an interesting way by the Sunny Rich Power Company, with PV panels providing partial covering over an area planted with fruit trees, and a semi-transparent PV roof over a section devoted to vegetable production.